A clean, well oiled machine will run great, but only if all of the parts line up and fit appropriately. Your chainsaw can't run with an over-sized chain, and it won't do you any good if the bar doesn't fit. Therefore, choosing a bar and chain isn't as easy as looking for the biggest and strongest ones available. You have to know what your chainsaw can handle, and which chains fit which bars. If you're looking for a replacement bar for your chainsaw, the first thing you'll want to do is determine the size of your bar. 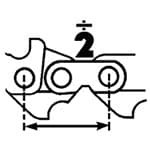 To find what's referred to as the "called length" of your chainsaw bar, you'll want to measure from the front of your chainsaw to the furthest cutting tip. Once you've measured, round to the nearest inch to get your called length. Now you can enter that measurement into the Bar & Chain Selector Tool to help find the right bar replacement for your chainsaw. To find a chain replacement, you'll need to also know the chain's "pitch" and "gauge." 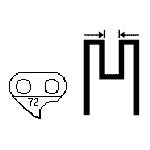 To determine the pitch (chain size), you'll need to measure the distance between any three consecutive rivets, then divide the result by 2. 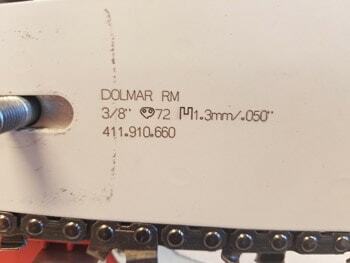 The rivets are the small, round pegs/studs that hold the chain segments together. Measure from the first to the third, then divide that number in half to get your chain pitch. Find a quarter, a dime, and a penny. Use a flat blade screwdriver or bar cleaning tool and clean as much sap and wood chips out of the bar as you can. Slide each coin into the chainsaw bar groove. Determine which one fits into the bar groove snugly without forcing it. Use the image below to determine the gauge. Now you can enter this information along with the bar length into the Bar & Chain Selector Tool to find the perfect chain for your saw. 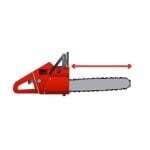 Using our Bar & Chain Selector Tool, you can find Oregon brand replacement bars and chains to fit a wide range of models from various chainsaw brands. Sizing Your Bar & Chain.. Our Power Equipment Direct how-to library can help you learn about Tips for Starting Your Gas or Electric Chainsaw, Benefits of Corded and Cordless Chainsaws and Proposition 65 Product Labeling.